Captain Bill Cason has over 20 years experience as pilot for United Parcel Service (UPS) Airlines flying the Boeing 757 / 767. His work with Pilot Associations began in 2003 when he took over the Cockpit Defense Committee for the Independent Pilots Association (IPA). He was instrumental in standing up the first “all-cargo” Crewmember Self-Defense Training (CMSDT) program in Louisville, KY in 2009, and serves as qualified Defensive Tactics Instructor for the TSA. 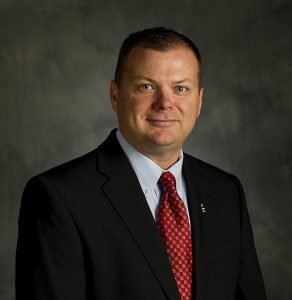 In 2010, he became the principal member of a joint UPS/IPA Security Task Force designed to detect, deter, and defeat threats against the UPS enterprise. Captain Cason worked diligently on Capitol Hill to add cargo pilots to the Federal Flight Deck Officer (FFDO) Program, which was accomplished in 2003 under the FAA Century of Aviation Reauthorization Act. The FFDO Program is a vital layer of aviation security providing the last line of defense for our nation’s flying public and precious cargo. Prior to UPS, he was a Fighter Pilot for the Oklahoma Air National Guard, flying the F-16 Fighting Falcon, rated as a four-ship flight lead and mission commander, which included combat missions over Northern Iraq. Captain Cason was then selected for training by the United States Air Force Office of Special Investigations (AFOSI). AFOSI is the premier criminal investigative agency for the United States Air Force. He was rated as a Special Agent andbegan working civil and criminal cases for the Department of Defense. After 9/11/2001, he was “activated” and worked directly on the PENTBOMB investigation as a full-time member of the FBI’s International Terrorism Squad based at the Dallas Field Office. He is current and qualified Peace Officer in his home state of Texas and a Lead Officer in the Fugitive Apprehension Division of the Denton County Sheriff’s Office, Denton, TX. Captain Cason is also a certified Firearms and Patrol Rifle Instructor for Denton County and the only reservist rated as a Designated Marksman.